Adhue Graphic Resources offers a full spectrum of Converting Services such as Slitting, Sheeting, Cutting, and much more! 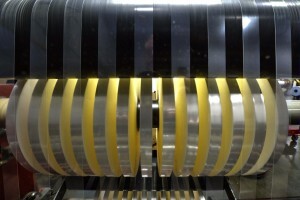 Converting printable substrates is a key process in the manufacturing and printing industry. Our highly experienced production staff focuses on precision and exacting specifications when processing the many converting requests we receive. Not only do we stock your printable plastics and pressure sensitive printing materials, we also have a wide range of converting services and experienced technicians ready to assist. Contact one of our friendly representatives with questions. We will be happy to help! We convert large industrial size rolls of material into more manageable sizes! 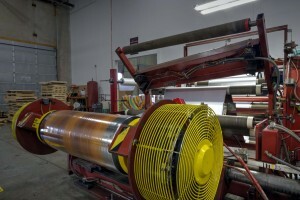 Adhue Graphic Resources has a variety of roll slitting machines that can cut these rolls into narrower rolls. We can also convert material that is from our inventory or your inventory and make them shorter or longer depending on your needs. When you need material cut down from larger material in either sheets or rolls! With it's state of the art microprocessor and 52" wide bed, our Eurocutter is the perfect machine to cut almost any sheets of plastic available up to .125 without chipping and to precision specifications. We also have available our Single Knife Cutter for cutting down any digital or pre-mask media from .10 to 60”. When you need rolls of material cut down to specific sized sheets! With our 60" Rosenthol Sheeter, we can convert rolled material within size and up to .030" thick quickly and accurately. We also have an Allen Bradley PLC that allows us to cut sheets in excess of 130" in length. We can also ad tissue interleaving to almost any material we sheet. We will work with you to find cretaive solutions to your converting needs! Adhue Graphic Resources understands that some jobs are not a cut-and-dried simple matter. Sometimes creative solutions are needed. With our extensive years of experience in the industry, we have the ability to approach your project with customized solutions that will best suit your needs. Contact us with any questions, we'll be happy to help!